Where to get a cheap meal in Taupo. Although we always encourage you to cook meals for yourself in your hostel to save money on food while backpacking in New Zealand, sometimes the lure of cafes, bars and restaurants gets too much… Especially in Taupo! The town is packed with enough eateries to make your mouth water. With this in mind, we have put together a list of cheap eats in Taupo so you don’t have to feel too guilty when treating yourself to some fine food! We’ve covered all backpacker budgets, to the dirt cheap meals for under $10 to the value-for-money deals with heartier meals for $11-$20 and $21-$30. Try cuisine from the classic Kiwi fish and chips to Indian lunch deals to keep your palette refreshed. And remember, we have heaps of meal ideas in our Hostel Recipes section to keep your own cooking fresh and cheap! Huka Prawn Park – Catch your own prawns and have them cooked up the restaurant! Huka Honey Hive – The largest showcase of honey products in New Zealand, get some free samples at the Honey Hive. Trout fishing on Lake Taupo – Take a fishing charter onto Lake Taupo to catch a trout and bring it back to cook! Crafty Trout Brewing Co. – Craft beer and cider-lovers can try a great selection at the Crafty Trout Brewery. The Taupo Market – Every Saturday morning, get yourself to the market at the Riverside Park! L’Arte Cafe – Check out some of the weird and wonderful mosaic displays while getting bite to eat. By the way, here are 10 Things to Do in Taupo at Night too! $10 fish, salad, break and house drink, and more! Finally, Rainbow Lodge hosts $5.90 pizza nights every Wednesday and 5.45pm. 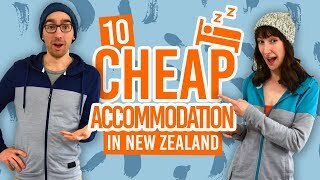 See more hostels in Taupo here and find more backpacker bars in New Zealand here. For some cheap sushi, head to Suncourt Sushi, Tamamutu Street, for $5 sushi meals. For a cheap and cheerful fish and chips, try a fishbox pack at The Fish Box, Rainbow Drive, for $8.50. Taupo is packed with fast food joints on Roberts Street, like Domino’s Pizza home of the $4.99 pizza. Burger prices for BurgerFuel starts at $5.90. Check out the world’s “Coolest McDonald’s” situated in an plane with a whole bunch of food under $10, as does KFC on the same street. For good-value pub meal, head down to the Mulligan’s Public House Irish bar, Tongariro Street, for $15 burger, fries and a beer/cider/wine! Get a hearty medium roast at Prime Roast, Gascoigne Street, for $15.50. For monster gourmet burgers, head to Pauly’s Diner, Paora Hapi Street, for $10-$16. Wednesday night is 2-for-1 ribs night at the Lake House, Roberts Street, and with great views over Lake Taupo. @Siam Thai Street Food Cafe, Heuheu Street, is BYO and often has some $15.90 entree with main meals on Book Me. You can always rely on Indian lunch deals for cheap eats in Taupo: Cinnamon Indian Restaurant. Tongariro Street, and Indian Delight, Roberts Street, both do curry, rice and naan lunch deals for $10.90! (Cinnamon Indian Restaurant also do $18 poppadoms, naan and curry between 5pm-7pm). For cafes in Taupo, check out Spoon & Paddle, Heuheu Street, with charming decor and some hearty meals priced between $12-$19. Replete Cafe, Heuheu Street, has a few affordable offerings like smoked mushroom quesadilla for $13.50 and bang bang chicken for $16.50. To add a bit of Greek flavour into your life check out KEFI, Ruapehu Street, and there’s something for everyone in Fine Fettle Cafe, Paora Hapi Street, with a menu under the $20 mark. Get yourself a different types of burgers and fries at Jolly Good Fellows, Lake Terrace, for $18-$22. For classic western-style food with a craft beer in-hand, check out the dinner menu at Rose on Roberts, Roberts Street, where you’ll get a hearty meal for around $24-$30. If you like seafood then don’t miss The Lazy Trout, Lake Terrace. You can’t miss it anyway because there is a huge trout sitting on a deckchair in front of it. Get yourself a classic Kiwi seafood meal for between $25-$30. There’s no messing around at the Ploughmans Inn, Charles Crescent, where there is a $25 menu, a $25 burger menu and a $12 dessert menu. If you like matching your wine and beer with food then the Vine Eatery, Tuwharetoa Street , is the place for you. Check out their extensive menu of cheeses, tapas, pastas, salads, and more that will easily see you to the $30 mark.